A few days ago my dermatologist recommended an over-the-counter powder and a prescription cream for athletes’ foot. I bought the powder for about $5 at a local store, then went to the pharmacy who said that 48g of the cream, Alcortin A, would cost $8,000. It seemed unbelievable, but it was not a mistake. Like the nationwide scandals regarding Mylan’s EpiPens, and a $1,100 pill for Hepatitis C, Alcortin A, is an example of price gouging. These drugs do not cost this much to make. While over-the-counter creams cost $5 to $20, Alcortin A’s inventor was selling the product for $189 before Novum Pharma acquired the patent and raised the price to astronomical heights, because insurance companies could be charged for it. This price gouging is possible because of a perfect storm of patent law and health insurance regulations. The patent holder has a monopoly on the product, and lack of flexible health insurance plans, usually paid for by third parties, forces buyers to pay the inflated price. While all these systemic problems should be addressed, this article proposes a patent law reform that would both (1) enable the patent holder to profit, and (2) return competitive market prices to the drugs. In most cases, patented products are sold at market prices, because patents for products like Benjamin Franklin’s stove, a better mousetrap, or good book were still forced to compete with the sale of other stoves, other mousetraps, and other books. The principle of supply and demand still functioned, and patent holders were protected as far as no one else could produce their particular product. No one else could make a Franklin stove, but Franklin couldn’t sell his stoves for $8,000 while other people sold stoves for $20. Further, inventors of products generally wanted all people to have their product because they believed it would make everyone’s life better. This patent system breaks down when (1) third parties own the patent solely for profit, (2) government regulations require third parties to pay for products regardless of price, and/or (3) there are no alternative products available for sale. In the case of Alcortin A, there are alternative products on the market that an individual can buy, but a third party bought the patent strictly for profit, healthcare industry regulations, and third party-payers encourage price gouging. In the case of the EpiPen, this problem is magnified because ownership of the product could make the difference between the life or death of an individual. One way to enable the patent holder to profit without price-gouging would be to force competition in the production and marketing of the product, by allowing anyone who wanted to produce the product to do so and pay a royalty to the patent holder. This royalty rate could be capped at a rate of something like 15%, as interest rates on credit cards are capped to prevent usury. There could be hundreds of companies producing the patented product and competing in the market, but the sale of every product would generate a royalty paid to the patent holder. Such patent laws would protect rights holders from products being sold without them earning a reward for their invention, but would prevent consumers from price-gouging by the rights holder through a competitive market. 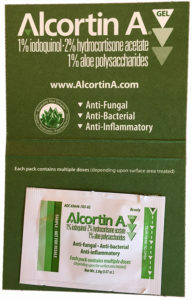 Alcortin A is a special blend of iodoquinol, hydrocortisone, and aloe, None of these items are expensive or in short supply. If other companies would be allowed to produce it and compete in a competitive market, the price would drop from $8,000 per 48g tube to perhaps $30, with Novum Pharma receiving a passive income of up to $4.50 on every tube other people produced for 17 years. If Novum Pharma could make their product more efficiently than competitors, they would have a greater market share, but they would still earn a profit on their patent even if others produced the product more efficiently. Revising patent laws to allow competitive production of patented products through a mandatory system of sub-rights payments would eliminate price-gouging while still rewarding inventors who produce new products. It would protect consumers by restoring market prices and protect rights-holders by earning a royalty on every patented product being produced and sold by others. This would be an ethical and fair solution to a broken patent system that is easily abused, especially in the pharmaceutical industry where government health care industry regulations currently invite the practice of price-gouging by drug companies. I like this approach. This mike make the big pharmacy stocks go down, but other companies and the wider industry go up. Patients would benefit which is most important.